Please refer to our stock # W-JO14R when inquiring. 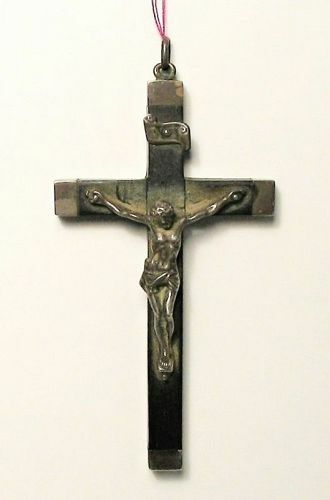 DESCRIPTION: A large pendant crucifix from the estate of Saint Katharine Drexel, the Christ figure crafted from sterling silver and mounted upon an ebony cross, with ends and back wrapped in silver. The lower back is stamped “Sterling, FRANCE,” and dates from the late 19th to early 20th C. Very good condition (silver has original patina). PROVENANCE: The Dahlgren, Drexel, Wharton Estate. This crucifix is part of a larger collection of rosary beads, crosses and bracelets with Catholic medallions, each belonging to St. Katharine Drexel (see the last photo). Please note that 25% of the sale of each item in this collection will be donated to the St. Michaels Indian School, St. Michaels, AZ, founded by St. Katherine Drexel in 1902. DIMENSIONS: 3.5” long x 1.75” wide. ABOUT ST. KATHARINE DREXEL: St. Katharine Drexel is the second American-born saint to be canonized by the Catholic Church, and is known as the patron saint of racial justice, education and philanthropy. This amazing woman was an heiress to a large bequest and became a religious sister and a brilliant educator. Saint Katharine Drexel (November 26, 1858 – March 3, 1955) was born in Philadelphia, the second child of a prominent and wealthy banker, Francis Anthony Drexel. The Drexels were financially and spiritually endowed, being devout in the practice of their faith and setting an example of true Christian living for their three daughters. They not only prayed but practiced what the Church calls the spiritual and corporal works of mercy. In 1884, while her family was visiting the Western states, Katharine saw first-hand the troubling, poor circumstances of the Native Americans and desperately wanted to help them. In 1891, Drexel professed her first vows as a religious, dedicating herself to work among the American Indians and African Americans in the western and southwestern United States. She took the name Mother Katharine and, joined by thirteen other women, soon established a religious congregation, the Sisters of the Blessed Sacrament. After three and a half years of training, she and her first group of nuns opened a boarding school, St. Catherine's Indian School, in Santa Fe, New Mexico. Other schools quickly followed - for Native Americans west of the Mississippi River, and for blacks in the southern part of the United States. In 1897, Mother Drexel asked the friars of St. John the Baptist Province in Cincinnati, Ohio, to staff a mission among the Navajos in Arizona and New Mexico on a 160-acre tract of land she had purchased two years earlier. This was the beginning of St. Michael Indian School in AZ. A few years later, she also helped finance the work of the friars among the Pueblo Native Americans in New Mexico. In all, Drexel established 50 missions for Native Americans in 16 states. By 1942 Drexel and her order had established a system of black Catholic schools in 13 states, plus 40 mission centers and 23 rural schools. Mother Katharine spent about $20 million of her private fortune building schools and churches, as well as paying the salaries of teachers in rural schools for blacks and Indians. Drexel established possibly her most famous foundation in 1915 - Xavier University, New Orleans, the first such institution for Blacks in the United States. By the time of her death, she had more than 500 Sisters teaching in 63 schools throughout the country. Her courage took the initiative to address social inequality within minorities. She believed all should have access to a quality education, and her selfless service, including the donation of her inheritance, helped many reach that goal. St. Katharine was beatified on November 20, 1988 and canonized on October 1, 2000 by Pope John Paul II.